cookies, biscuits, fondant, cake or dough. It is not an expensive item and I highly recommend you try this out for yourself before you give it as a gift first because some of the reviews say that it is uneven in the embossing and sometimes you need to apply more pressure. I tried it on something and felt the same way. I rolled it out and felt that a lot of pressure is needed on all sides even the middle to achieve the look above. The pattern looks like a Reindeer pattern but is likely an Elk instead. This item is fulfilled by Amazon but is sold through a 3rd party seller. 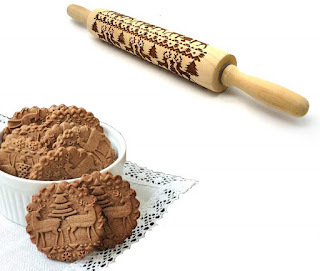 The Christmas Embossed Rolling Pin is $11.89 and is sold on www.amazon.com. Purchase now to have time to work with it and to allow yourself time to give as a gift too.